Do you need a simple storage solution for your desk or shelves? This is a very easy project that can be done in a short amount of time. 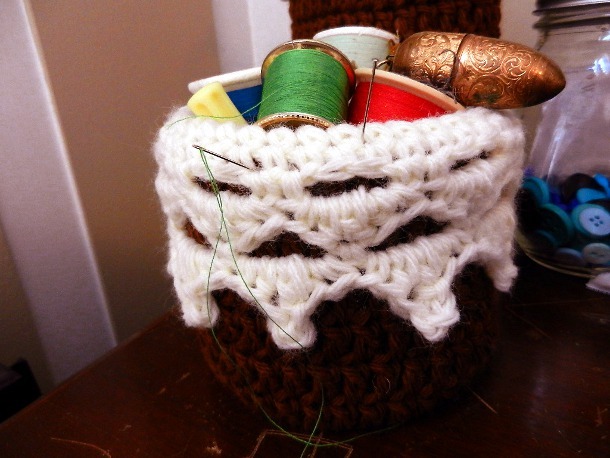 It uses an oatmeal container and some simple crocheting skills. They are sturdy and once you are done you cannot tell that they used to take up space in your pantry! Note: You can cut your container down to a size that you like but make sure you cut it down by inches. Also this will affect how many rows you will crochet. Rnd 1: With C1, ch 4, make 9 dc in the 4th ch (the rest of the chs form the first dc) from hook, sl st into beg dc for a total of 10 dc. Rnds 6-17 (or till you reach the top of the container): Ch 3; dc in each st around, sl st into beg dc. (40 dc) At the end of your last row, finish off. With C2, repeat Rnds 1-17 of Outer Layer (do not finish off). Insert the inner layer into the container and slip the outer layer over the container. Match up your edges, and crochet the two layers together in the next row. Rnd 22: Sl st into the ch-sp, ch 1. *(Sc, hdc, dc, ch 3, sl st into dc (picot made), hdc, sc) into the ch-sp. * Repeat from * to * 9 times, sl st into beg sc. (10 petals with picots) Finish off and weave in your ends, fold edge down over outside of container. Julia is currently living with her family in Toronto Ontario, while her husband works on his Doctorate degree. They are enjoying the change in their lives that this recent move has made. She thrives on creating things. 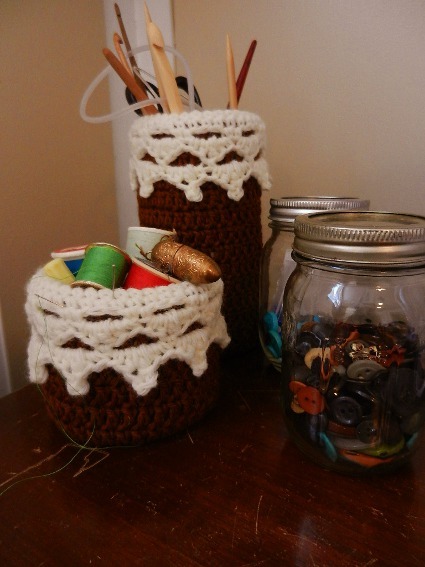 Usually that means crocheting, but she also enjoys working with any type of needle, cooking, and card making. If you would like to keep up with her and all of her crafting adventures, you can at designsbydiligence.blogspot.com. Love the scarf in the pic!